Download CPT Admit Card/Hall Ticket For June 2019 Form Here! CPT last attempt will be in June 2019. The exam registration for the course will be closed from 24th April 2019. The CPT application form will be available from 4th April 2019. All those students who registered after June 2017 were enrolled under new Revised Schemes of Training and are eligible to appear for CA Foundation exams. After you register for CPT exams, 21 days before your examination ICAI upload CA CPT admit card under your login id on their website. Print and download CPT Admit Card June 2019. Admit card is used as a gate pass at the examination center. 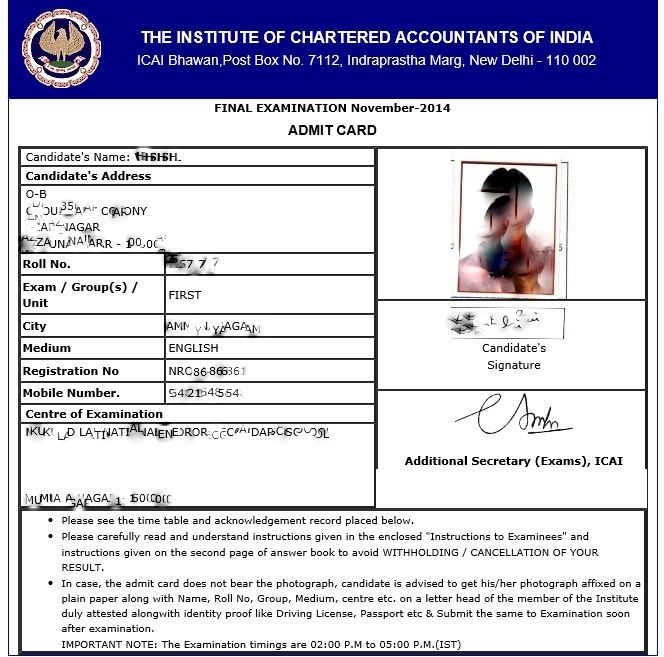 Read this article carefully to know how to download Admit card, what to do if you lose your admit card and when ICAI will issue CA CPT admit card. 1.You Should Download the Pdf Format of Your June 2019 Admit card of CPT and Should Take a Printed Copy ICAI gives you only 3 chances to download your admit card. If you have pdf format with you, you can print it as many times you want. 2)You Should Check All Your Details Once it’s been uploaded on the website. Any discrepancies with your details should be cleared before your examination date. 3)You Should Always Carry Photo Ids to Examination Center You should always carry photo ids like voter id or driving license along with admitting card to the examination center. 4)No Fresh CPT Admit Card is Issued by ICAI Hence you need to be careful and consider it as an important document. Log in using your login ID(Registration Number) and password. Click on the tab in front of Admit Card. Your admit card and instruction will be displayed on your screen. You can take a printout of this screenshot for your future references. Discrepancies in an Admit Card Details. You should check all your details once it’s been uploaded on the website. Any discrepancies with your details should be cleared before your examination date. It is advisable to upload scan copy of photograph and Signature along with application form. Admit card take that copy and reflects your details accordingly.”But if you miss your photograph and signature on admit card then still your admit card is valid”. In case the admit card does not carry your photograph and signature, it is advised to paste the photograph and duly sign at the marked place on the printout of the admit card. Carry the duplicate copy for personal reference. Students need to submit the original attested admit card to the examination center and keep the duplicate copy to themselves. Students should also carry Two stamp size photograph (matching with the photograph affixed on the attested letter referred above) to the exam center to attach the same photo on attendance register. How does member of Institute attest the Admit Card printout? Member may indicate his/her Name, membership number, and office stamp while signing/attesting at the bottom of that page. It’s good practice to check the details soon after printing admits card from the website. If you find any discrepancies call at helpline desk telephone no 0120- 3054851, 3054852, 3054853,3054854,3054835,4953751,4953752, 4953753 and 4953754. As we have said that, admit card is used as a gate pass to your examination centre, in any case, if you lose your admit card or not able to carry it to the examination centre then there is another way you could crash the gate. You should keep a photocopy of the filled application form and the acknowledgement issued by ICAI as a proof of submission of the form. In case if you cannot carry the admit card for any reason, you can use this photocopy as admit card. No, your admit card doesn’t mention any information related to result or performance in examination like distinction or exemption. It only contains details about examination Centre, date time and city. We are providing you with a sample of admit card for CPT for your reference. Keep yourself healthy and vigilant.